Brother-Sister team did it!!! Parkano NDS, Tibetan Spaniels under breed specialist Mr Juha Kares (Chic Choix). Both CC’s to our yougsters! ”Velho” Qi Gong’s Kanye West. ”Lumo” Qi Gong’s Nicki Minaj. 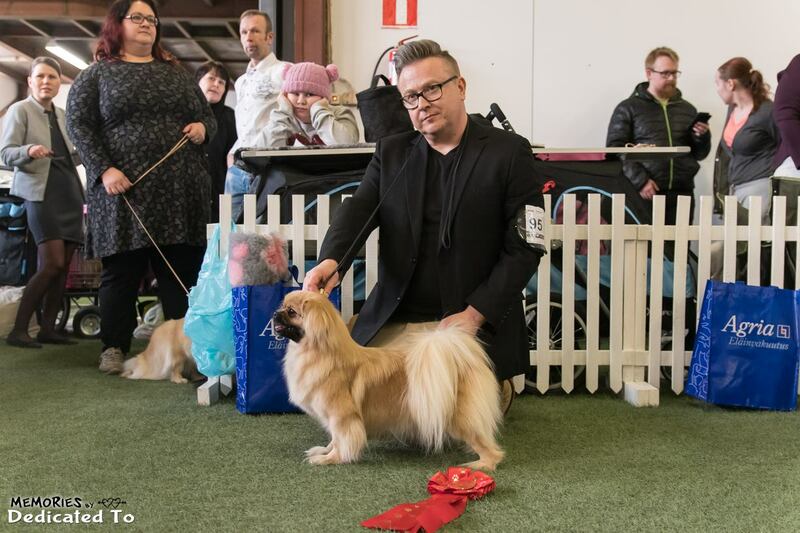 Both dogs bred/owned/handled/loved by Mikko Lindroos (Qi Gong’s) and Kari Kuosmanen (Flying Carpet’s). Vantaa NDS 1.9.2018 Russkaya Tsvetnaya Bolonka’s under Annukka Paloheimo, FI. BOB + CAC to ”Viivi” Flying Carpet’s Vip at Mir Bred/Owned by: Kari Kuosmanen. Placement owner and handler Niina Junttila. Heinola NDS 19.8.2018 Russkaya Tsvetnaya Bolokas under judge Juha Putkonen, FIN. BOB + CAC to our ”Viivi” Flying Carpet’s Vip At Mir. Placement owner and handler: Niina Junttila, FIN. Bred owned by.Kari Kuosmanen (Flying Carpet’s).